Men, come on out on June 24th for our 22nd golf fellowship. We will be playing from 1PM to 6PM at a cost of $45 per player at Temecula Creek Inn. We hope to see you there and if you have any questions please get in touch with us! 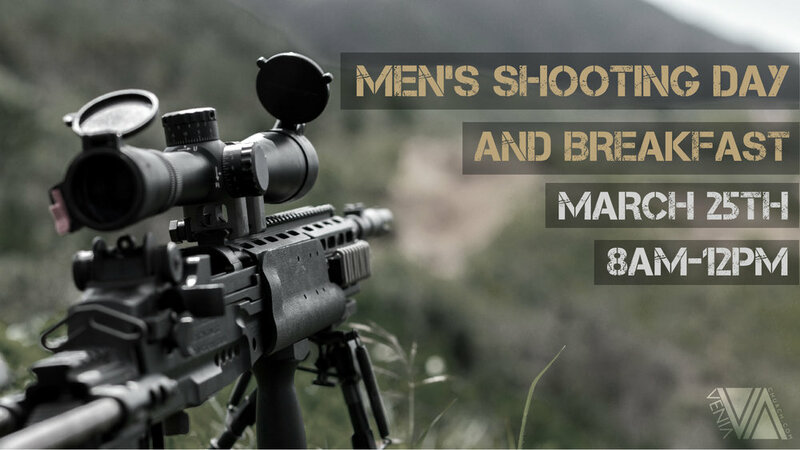 Men come out and join us for an action packed day of food and guns! What more could you ask for on a Saturday morning! We will all meet March 25th at 8:00AM at Mynda's Country Kitchen 27400 Winchester Rd, Hemet, CA 92596. Bring your firearms, ammo, and gear to be ready for a fun and safe shooting environment. There is also an option to take a class provided by one of the men from the church who is an NRA certified instructor. Below you will see a download option to view the necessary items needed to participate in that class. Our culture needs men to be men of God. Men who desire more of God's strength, courage, resolve, presence, wisdom, patience, and self control. Join us for Venia's first ever Friday night men's conference for a night of worship, encouragement, and challenge to be all that God has called us to be.Men, don't settle for less, but settle for MORE. More of what God has planned for you. Come out to Venia Church February 3rd for our first men's event. There is no cost involved and we hope that you will join us!